The National Trust flag is commonly seen as white on green with "National Trust" in white below the emblem. The National Trust (www.nationaltrust.org.uk) is a charity which operates in England and Wales and in Northern Ireland. It protects and opens to the public historic buildings and gardens, industrial monuments, important landscapes of all sorts and archaeological remains etc. (There is a separate National Trust for Scotland). Graham Bartram's book "British flags and emblems" shows the emblem and lettering are white on a very dark green field. Castle Drogo - almost indistinguishable photograph, but showing that the background of that particular flag, at Castle Drogo, is not dark green. Chartwell, Kent, former home of Sir Winston Churchill, flying the Union Flag. The image above owes its overall design and proportions to that at http://www.flags.net/country.php?country=UNKG&section=CURR&category=CIVN. I have taken the logo (or as the N.T. seem to say, the 'emblem') from a document on their website, as I have the text of their name. The colour is still non-browser-safe, as it has to be, but it's not the same as on my previous image. This grey-green comes from a PDF document on the N.T. website (at www.nationaltrust.org.uk/main/nt_brand_all-2.pdf) which defines their green as PMS 5535. I have used the RGB value as it appears in that PDF. The National Trust operates in England, Wales and Northern Ireland only - there is a separate National Trust for Scotland. "National Trust (formally: National Trust for Places of Historic Interest or Natural Beauty) is a conservation organisation in England, Wales and Northern Ireland. The National Trust was incorporated in 1895 as an "association not for profit" under the Companies Acts 1862–90, in which the liability of its members was limited by guarantee. It was later incorporated by six separate Acts of Parliament: The National Trust Acts 1907, 1919, 1937, 1939, 1953, and 1971. It is also a charitable organisation registered under the Charities Act 2006. The trust describes itself as "a charity that works to preserve and protect historic places and spaces—for ever, for everyone". The trust was founded on January 12, 1895 and given statutory powers, starting with the National Trust Act 1907. Historically, the trust tended to focus on English country houses, which still make up the largest part of its holdings, but it also protects historic landscapes, historic urban properties, and nature reserves." Sources: https://www.nationaltrust.org.uk/lists/our-history-1884-1945, https://www.nationaltrust.org.uk/features/about-the-national-trust, https://www.nationaltrust.org.uk/about-us and https://en.wikipedia.org/wiki/National_Trust_for_Places_of_Historic_Interest_or_Natural_Beauty. Also note that on this flag, the oak twig is larger and the inscription is missing. II was on the tidal island of Lindisfarne (Holy Island) in Northumberland (north-east England) for a few days, where the National Trust owns Lindisfarne Castle. During the opening hours of the Castle, a flag with the Trust logo was flown from the Castle flagpole, green twig on a white field. I have estimated both the ratio and the proportion of the flag which the logo takes up. The logo comes from a report in PDF format on the Trust website, and I have kept the colours used there, even though they are not browser-safe. The logo is very widely used and this 'National Trust green' is well-known. 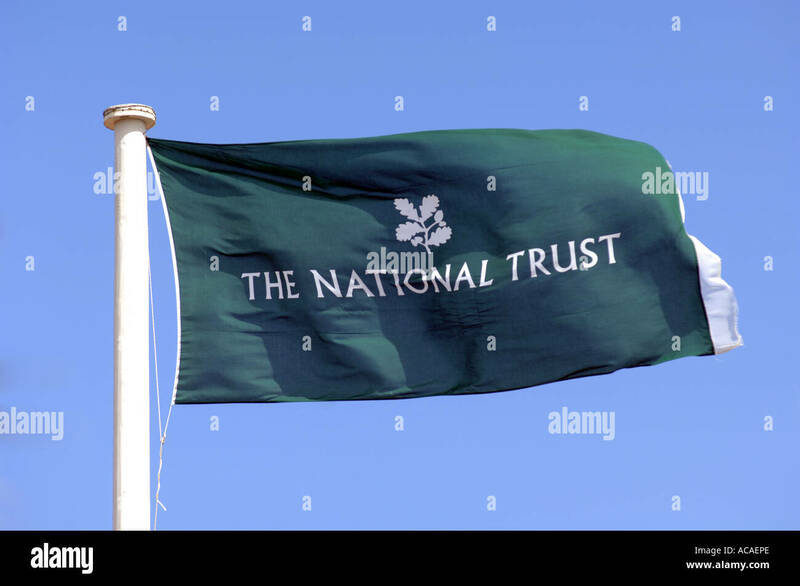 The emblem of the National Trust ...is a green sprig of oak leaves and acorns, but our flag is that same sprig but in white on a green flag with 'NATIONAL TRUST'...written below". 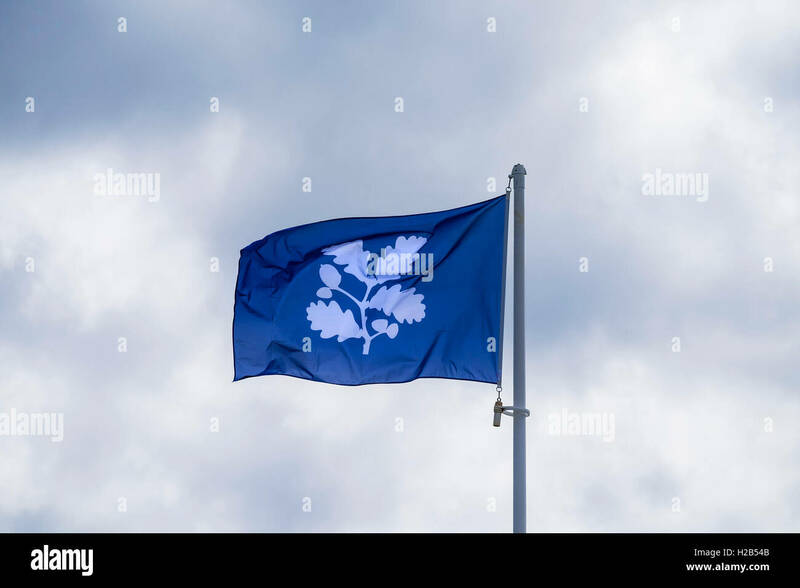 They also go on to say that "we have never heard of a white flag with the emblem in green, and we do supply flags to various of our properties as suitable, but it is our emblem and such might unofficially exist".